At Jackson Sunday we had five youth fishing the youth tournament and four teams of youth and adults in the buddy part of the tournament. After six hours of casting on a beautiful day we brought in 20 keepers weighing about 26 pounds. Almost all were spots but they bit pretty good. In the Youth tournament Dawson McMonigle won, Tyler Gruber was second and had big fish and Hunter Jenkins placed third. Treston Cheeves and Kemson Cheeves also fished but did not place in the top three. In the Buddy tournament Sam Smith and Dawson had five weighing 7.14 to win, Hunter and I had five weighing 6.76 for second, third was Raymond English fishing with his two grandsons Treston and Kemson with two bass at 3.88 and big fish weighing 3.09 pounds and fourth was Larry Cook and Tyler with one at 1.35 pounds. Hunter and I caught more than a dozen keeper spots and some smaller fish, mostly on jig head worms. The fish we caught were all on rocks, something spots love, and most were right off the main lake in five or six feet of water. Many of them picked up the bait and started swimming with it without me feeling the hit. I kept some of the spots and fried filets on Monday night. They were delicious. Jackson is overrun with spots under 14 inches long, there is no size limit on them since they are invasive and hurt a lake when they get in it, and taste good. Right now is a good time for a trip to Jackson to catch some to fry. This entry was posted in Bass Fishing, Tournament Fishing on March 31, 2015 by ronniegarrison. Politicians will say anything to get elected. That is why it is so important to examine their record and look at what they do and say before running for office. Listen to what they say but verify what they have done. Never has that been more important for gun owners than in this presidential election. http://www.ontheissues.org/ where you can find lists of votes and statements without comment. Senator Obama says he believes the 2nd Amendment is an individual right. He also said he supported cities like Washington, DC and his home city of Chicago banning the ownership of guns. He co-sponsored a bill to limit the purchase of handguns to one per month. He refused to sign a Congressional Brief in support of the Heller case that overturned the DC handgun ban. And he endorsed the Illinois ban on handgun ownership. Last January Obama called for “common-sense” gun licensing. He supported the renewal of the “assault weapon” ban. He voted against stopping lawsuits against gun manufacturers. He called for a ban on semi-automatic guns and for more gun possession restrictions. And he wanted to punish gun sellers if their guns ended up being used in crimes. And he is in favor of banning bullets that can penetrate “bullet proof” vest, which seems to include all center fire rifle ammo. Senator Obama is rated “F” by the NRA. Senator Biden recently said he would not let Obama take his Beretta away from him. He voted to keep the assault weapon ban and voted for the original ban. He had introduced several versions of the ban before it was passed. He voted against ending lawsuits against gun manufacturers twice. And he did not sign the Brief in the Heller case supporting the 2nd Amendment that was signed by 300 members of congress. Background checks at gun shows received a yes vote from Biden two times. He also voted against increasing penalties on criminals using guns. Biden voted against letting guns be sold without trigger locks, voted for the Brady Bill and pushed to make it stronger. Senator Biden is rated “F” by the NRA. Senator McCain says he supports the 2nd Amendment as an individual right. He signed the Brief in support of Heller and says he knows how to use guns but does not own one. He voted against lawsuits against gun sellers three times and voted in favor of allowing guns in National Parks. He opposed extending the “assault weapon” ban and voted against the original ban. He also voted against the Brady Bill. McCain has voted against background checks at gun shows although he sometimes supports them. He voted for more penalties for criminals using guns several times. McCain has called for a ban on “cheap” guns, requiring trigger locks and gun show background checks in the past. Senator McCain is rated “C” by the NRA. Governor Palin says she supports the 2nd Amendment as an individual right. She is a life member of the NRA and hunts and fishes as did her father. She hunts as much as she can and keeps her freezer full of wild game. She supported the Heller case ending the DC handgun ban. The NRA says “Gov. Sarah Palin would be one of the most pro-gun vice-presidents in American history, and Joe Biden would definitely be the most anti-gun. This entry was posted in Guns and Gun Control on March 29, 2015 by ronniegarrison. 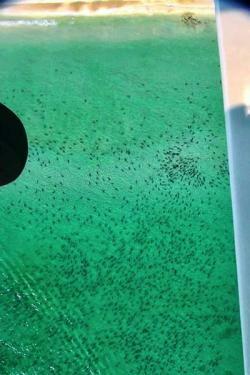 What Are Florida Shark Migrations? The sharks are swarming off the east coast of Florida again, providing the usual titillating footage for news helicopters who delight in showing this “dangerous” phenomenon of literally thousands of the big predators massed in an annual migration. To experienced coastal anglers, the migration is of interest not because it means the sharks are on the hunt for human flesh, but because when the sharks come, that means the gamefish have come as well. The whole migration goes north in spring, typically late March through mid-April, and south in fall, spanning late October and early November. The movement depends on water temperature, and on the baitfish that follow the temperature curves. The baitfish–mullet, menhaden, sardines, cigar minnows, thread herring and more–come in unimaginable numbers, absolute masses that can cover the ocean for hundreds of acres at times, and close on their heels will be bonito, Spanish mackerel, king mackerel, cobia and an assortment of other camp followers, and weaving in and out of the gamefish are the pods of sharks, which eat both the larger bait and the gamefish. Snook and tarpon, not so often thought of as migratory species, also migrate with the bait, though the snook apparently remain within a few miles of their home inlet and the tarpon rarely get anywhere north of the Carolinas. All of this migrating and eating suggests two things to seasoned observers–first, right now is a VERY good time to go fishing on the east coast of Florida. And second, this is not a great time to be surfing or swimming there, particularly where the bait and the sharks are thickest. There are two reasons for this–first, the sharks that prowl close inshore are usually are spinners and blacktips, not the bigger species like the bulls and hammerheads, and secondly, all of the sharks that are in the surf zone are there to eat baitfish, not people. The murky water can make it difficult to tell bait from a flashing hand or foot, and most experts think this is the cause of most bites. Surfers have a similarly cavalier attitude–if the waves turn up strong, they go paddling outside the break line–right where the majority of the larger sharks are chasing the gamefish and the larger bait. Not surprisingly, surfers here get bitten with some frequency relative to their small numbers compared to the number of swimmers just off the beaches. Even at that, the number of shark bites is very low, and as the researchers frequently tell us, the odds of being struck by lightning on the beach are actually considerably greater than of being bitten by a shark. But clearly, during these few weeks when the parade of bait, gamefish and shark is at its spring peak, it’s not a great idea to go plunging deep into Florida’s east coast surf. This entry was posted in Saltwater Fishing on March 28, 2015 by ronniegarrison. What Is the America’s Wildlife Museum and Aquarium? Springfield, Mo. – Johnny Morris, founder of Bass Pro Shops and leading conservationist, in partnership with noted conservationists from around the world, has unveiled plans behind America’s Wildlife Museum and Aquarium in Springfield, Missouri, envisioned as the most elaborate conservation attraction of its kind for fish and wildlife conservation. Scheduled to open in spring 2016, the 315,000-square-foot educational experience will consist of multiple thematic attractions and exhibits on a scale unlike anything else in the world. Anchored by an all-new world-class aquarium, the massive facility brings together a variety of compelling opportunities for visitors of all ages to engage with nature like never before. Through immersive environments and incredible live animal habitats, the experience aims to showcase the beauty of wildlife while celebrating the critical role hunters and anglers play in wildlife conservation by honoring past accomplishments and ongoing efforts. When fully realized, the attraction will consist of an all-new 1.3-million-gallon aquarium adventure showcasing 35,000 live fish, mammals, reptiles and birds in an immersive tour through the world’s marine habitats; a wildlife museum that brings visitors eye-to-eye with amazing mammal specimens from North America, Africa and the Arctic; and a conservation education center for youth programs, conservation groups and events. The centerpiece is an entirely new world-class aquarium adventure designed by renowned aquarium architect Michael Olesak that plunges guests into a thrilling tour of the world’s oceans, lakes and streams, bringing them eye-to-eye with more than 35,000 animals. Visitors will encounter sharks, rays, jellies, eels and more in fully immersive environments that transport visitors to some of the wildest aquatic ecosystems on earth. • New Fishing Heritage Hall – Visitors will first enter the breathtaking 60,000-square-foot entry hall, home to a dramatic 300,000-gallon “open ocean” habitat teeming with saltwater marine life including mahi-mahi. Guests can become awe-inspired by a collection of boats fishing legends were made on, including the very first Tracker and Ranger boats, as well as historical boats used by Jimmy Buffet, and Ernest Hemingway. In addition, guests can view renowned author and angler Zane Grey’s famous boat, moved to the Museum from New Zealand, where the first 1,000-pound marlin was caught. The Hall also serves as the ticketing and lobby area. • New aquarium adventure – Designed to transport visitors to some of the world’s greatest undersea environments, visitors will discover an elaborate trail system that winds in and around marine habitats teeming with life, including a sunken shipwreck, colorful coral reefs, tropical coasts, underwater caves, steamy rainforests, freshwater swamps and more. Throughout the more than one-mile journey, visitors can get closer than ever before with surprises around every turn including opportunities to get “hands-on” with a variety of ocean animals. The aquarium celebrates the diversity of all sea life, especially game fish, and highlights the need to conserve the beautiful ecosystems they call home. • New International Fishing Hall of Fame – The new International Game Fish Association Fishing Hall of Fame will highlight some of the sport’s most accomplished men and women through interactive exhibits, personal artifacts and masterfully recreated replicas of world-record fish mounts from both freshwater and saltwater species. The International Game Fish Association, which represents members in more than 125 countries, has hosted this interactive collection at its global headquarters in Dania Beach, Florida, for the past 16 years. Relocating the exhibit to the new Museum will provide substantially more exposure and engage more of IGFA’s members and the public. Walk amongst the largest land mammals on earth, go eye-to-eye with the Arctic’s top predator and discover some of the most spectacular game animals on the planet in this sprawling 50,000- square-foot showcase of amazing mammals from around the world. • Hunting Heritage Hall – Meticulously recreated lifelike environments will educate visitors about the importance of conserving the icons of the animal kingdom. Inspired by Johnny Morris’ visits to the great natural history museums of America, this all-new showcase takes the concept even further with lifelike animal diorama displays surrounded by recreated natural settings including hand-painted murals, foliage, waterfalls, lighting, sound, wind, and temperature settings to transport visitors to many of the world’s most diverse habitats. Special features include the King of Bucks, the largest collection of trophy white-tailed deer in the world, and Art Dubbs’ record collection of sheep from around the globe set amongst a dramatic rocky mountain cliff. Displays highlight the work of America’s leading conservation groups including Ducks Unlimited, Rocky Mountain Elk Foundation, National Wild Turkey Federation and many others. • Boone and Crockett Club’s world-famous National Collection of Heads and Horns – Experience a part of history through more than 40 historically significant North American big game mammals that originally helped bring conservation to the forefront of public awareness in America when it debuted at New York’s Bronx Zoo in 1922. Established by the Boone and Crockett Club, a wildlife conservation organization founded by Theodore Roosevelt, the collection originally exposed thousands to big game animals at a time when their numbers were dwindling, drawing national attention to the plight of wildlife after decades of unregulated harvest and irresponsible land use practices. Amazed by the natural beauty, an inspired and determined public ensured subsequent legislation proposed by Club members to protect wildlife and habitats were given top priority. Today, guests can still marvel at the bears, bison, caribou, elks, walrus and other big game animals, many of which are considered world-record holders for their size. The collection is relocating from the Buffalo Bill Historical Center in Cody, Wyoming, to once again introduce this historic and influential collection to new audiences. The conservation leaders of today and tomorrow already gather together at the completed 50,000-square-foot Conservation Education Center, which connects to the Museum facility. • The Wonders of the Ozarks Learning Facility School, a comprehensive outdoor learning school operated in partnership with Springfield Public Schools, Missouri Department of Conservation and Bass Pro Shops, is a national model for outdoors education. The school educates and inspires future conservation leaders by offering lucky fifth-grade students a full-time curriculum for an entire school year. While students spend significant time in nature, fully equipped classrooms and labs offer everything they need to learn about and protect the outdoors for life. • National Outdoor Recreation and Conservation School, which runs outdoor conservation education programs for families across Missouri. • Elaborate banquet spaces with a signature wilderness atmosphere are available for national conservation organizations as well as local community groups throughout the year. Conferences, meetings, lectures, workshops and special functions can be accommodated with a full kitchen and hospitality team to support catering and events. • The National Archery Hall of Fame seeks to preserve the sport’s history and tradition with more than 1,500 artifacts including a handmade bow made by the Native American Apache leader Geronimo. By honoring the outstanding men and women in the sport, the experience sends a message that anyone can enjoy archery as a gateway to appreciating the outdoors. • The NRA Sporting Arms Museum showcases the development and evolution of hunting arms in America from colonial times to today in this educational gallery and one of the premier firearms museums in the world. Home to nearly one thousand artifacts the Museum tells the story of American icons such as Lewis and Clark and Theodore Roosevelt. 500,000 visitors experienced the Museum in its first 18 months. The Museum complements its neighbor, Bass Pro Shops’ iconic flagship store. Known as the “Grandaddy” of all Bass Pro Shops locations, this is the largest Bass Pro Shops Outdoor World, and the number one tourist attraction in Missouri, attracting four million sportsman and outdoors enthusiasts each year as Missouri’s most popular tourist destination. Together the campus components create a remarkable new “must-see” destination poised to become a world-class attraction for the millions who enjoy outdoor recreation. More details about the new Museum and its features will be available in the coming months. Established by Bass Pro Shops Founder and noted conservationist Johnny Morris, The Johnny Morris Foundation is a national leader in promoting and supporting conservation and outdoors education. In addition to supporting a variety of conservation partnerships and education initiatives nationally, the Foundation currently operates Dogwood Canyon Nature Park, a 10,000-acre park in Lampe, Mo. and will operate various components of America’s Wildlife Museum and Aquarium scheduled to open in spring 2016 in Springfield, Mo. Founded in 1939, the IGFA is a non-profit organized under Section 501(c)(3) under the Internal Revenue Code and is best known for conservation efforts of fisheries, educational programs, rule-making and for maintaining worldwide game fish records in freshwater, saltwater, fly fishing and junior angler categories. IGFA members are located in over 125 countries. For further information, contact the IGFA Fishing Hall of Fame & Museum, 300 Gulf Stream Way, Dania Beach, Florida 33004; phone 954-927-2628, fax: 954-924-4299, website: www.igfa.org. The Boone and Crockett Club was founded by Theodore Roosevelt in 1887 as North America’s first hunting and conservation organization. Its mission is to promote and encourage hunting, and to maintain the highest ethical standards of fair chase and sportsmanship in North America. Join us at www.boone-crockett.org. 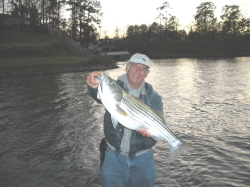 This entry was posted in Conservation, Fishing Ramblings - My Fishing Blog on March 26, 2015 by ronniegarrison. Bass Pro Shops Pro Qualifier Baitcasting Reel – List price $99.99 – often on sale for significantly less. A few weeks ago during a club tournament the level wind on one of my favorite baitcasting reels started sticking on the side when it started to reverse. I have had this problem on several reels over the years. With heavy use the paul that moves back and forth in the screw and moves the line guide wears and sticks. Everytime in the past it was a simple matter to get it replaced but my repair shop could not get one for this reel. So I needed a new reel. I had heard some good things about the Bass Pro Shops Pro Qualifer reel so I checked online and they were on sale for $79.99. The reviews there were very good. I have a media discount card – disclaimer, I get 25 percent off on Bass Pro Shops branded items – so I drove to the Macon Bass Pro Shop. Unfortunately for me, the sale ended the day before I went, so with my discount I got two of the reels for about the sale price that I missed. I put the reels on two of my rods, replacing the broken reel and changing out an old round reel on another rod. That Saturday my bass club had a youth tournament at Jackson Lake and a club tournament on Sunday at Lake Oconee, so I got to test them out under tournament conditions. Both reels were great! I cast a chatterbait on one and a crankbait on the other. I had spooled both reels with 14 pound Bass Pro Shops Excel Monofilament Line. I have used this line in the past and it is a very good line for the price. I got a 120 yard spool for $10.99, a little less with my discount. Goth reels, with just a little adjustment, were easy to make long casts without backlash. They were very smooth during the cast and retrieve. And the drag with smooth and easy to adjust to the tension I wanted for the rod and bait I was using. Bottom line is, I will definitely buy more of these reels to replace some of my older reels. This entry was posted in Fishing Product Reviews, Fishing Tackle on March 25, 2015 by ronniegarrison. What Are Some Safe Boating Tips? ST. PETERSBURG, Fla. —The Coast Guard wants to remind mariners to have the proper safety equipment aboard their boats after a busy weekend in the Tampa Bay area. Watchstanders at Coast Guard Sector St. Petersburg responded to 12 search and rescue calls over the weekend. The majority of the boaters did not have the proper safety equipment aboard their boats. Crewmembers from Coast Guard Station St. Petersburg, Coast Guard Air Station Clearwater, Florida, Coast Guard Station Cortez, Florida, and Coast Guard Station Fort Myers Beach, Florida, saved 11 lives, and assisted 12 people since Friday. A VHF-FM marine radio is the best method of communication while on the water. Although cell phones are a good backup, they can be unreliable due to gaps in coverage area and the inevitable dead battery. Below are more safety tips mariners should review before heading out on the water. Inspect your boat to avoid breakdowns that often lead to tragedy in the water. Obtain a free, no-fault vessel safety check, which can be conducted by the Coast Guard Auxiliary, before heading out on the water. The safety checks are courtesy examinations of your vessel, verifying the presence and condition of certain safety equipment required by state and federal regulations. Wear your life jacket! More than 80 percent of boaters who drown were not wearing their life jackets. In an emergency there might not be enough time to put one on, so wearing one at all times may save your life. Don’t drink and boat! The federal BAC limit is .08 for a BUI. Alcohol can impair a boater’s judgment, balance, vision, and reaction time. Have working communication equipment aboard your vessel. This entry was posted in boats and boating on March 24, 2015 by ronniegarrison. Why Shoud Law Abiding Citizens Carry Guns? Governor Perdue finally signed HB 89 into law the very last day he could in 2008. By waiting so long he gave the liberal media and other anti-gun groups several extra weeks to rant and rave about the bill, then brought it back to the forefront, giving them another chance to say silly stuff. If he had signed it as soon as it hit his desk he could have avoided many of those anti-gun comments. These folks have a total disconnect from reality. How will passengers know about concealed weapons? They should be thankful if some on the bus have them. An Atlanta Constitution news article on May 16, 2008 titled “Abductor arrested but where is victim?” tells how “A man drove his car in front of a bus, forcing it to the side of the road, then boarded the bus and forced the woman off at gunpoint, Dekalb police said. What are the odds those passengers felt secure, knowing no law-abiding citizen was able to have a gun on the bus at that time? No mention if the “abductor” had a concealed carry permit. And he ignored the law. What a surprise. Thugs ignore the law, take guns where ever they want to and commit crimes, while some irrational people yell for laws restricting where law-abiding gun owners can take their guns. People with that mind set will never get the idea of self protection. The new law does give you some additional places you can carry concealed legally with a permit, but be careful. Gun control fanatics will do everything they can to get around the law. For example, GeorgiaCarry.org reports a Marta official said “MARTA police plan to ask passengers with visible guns to conceal them. They will ask the public not to approach fellow passengers with guns, but to contact MARTA police.” If they harass you, you could get in the middle of a mess. Be careful in restaurants. Up to now you could walk into KFC with a concealed gun and be legal but if you went next door to Applebys with your gun you would be breaking the law. Now you can carry in Applebys but can not have a alcoholic drink. Don’t mess up and have even one beer while carrying. Some fanatic may be trying to catch you to make a point. In more discouraging news, Jay Wallace, owner of Adventure Outdoors, had to stop fighting the lawsuit filed against him in New York. After several rulings against him by a very anti-gun judge, he gave in to Bloomberg’s demands that his store be supervised by a court appointed federal monitor. I am sure the cost of the legal fight was part of the reason Mr. Wallace had to give in. I hope Mr. Wallace still has his civil suit against Bloomberg in the Georgia courts and does not have to drop it because of his action in the New York courts. He should get a more honest judge and fair treatment here, even if he will not get more accurate and honest coverage from our local liberal media. This entry was posted in Guns and Gun Control on March 23, 2015 by ronniegarrison. How Can I Catch Pre Spawn Walleye In Rivers? The first stretch of consistently warm weather in the spring melts the snow in our yards, gets the sap moving in the maples, and brings anglers and their boats out of hibernation. The lure of an early spring trophy walleye draws an increasing number of boats to large rivers that host significant migrations of walleyes and sauger from downstream lakes, reservoirs, or riverine areas. While fish numbers in spawning areas will slowly increase during this time of year, it’s important to recognize that the spawn may be several weeks away; dictated by factors such as water temperature and moon phase. Consistent fishing at this time of year demands attention to detail, and a willingness to adapt to changing water conditions. While the weather is warming and becoming consistently more pleasant, water conditions are changing in a wide variety of ways. As water flows will slowly begin to increase, that increase in flow will bring with it a decrease in water clarity and a decrease, yes a decrease, in water temperature. Fishing in cold, dirty water is very different from fishing in the cold, clear waters of late winter. River rookies are often caught off-guard by the fact that water temperatures always fall before they begin their long march to summer highs. The reason for this dip is simple: melting snow generates large volumes of ice-cold water. As that snowmelt travels under the receding snowpack and over still-frozen ground, it carries those cold temperatures into the streams and creeks that feed larger, walleye-laden rivers. The first week of March features typical late-winter temperatures in the low 30s. Warm spring weather slowly increases the water temperatures, until the icy cold snowmelt hits the main stem of the river, causing water temps to crash back down. The water will stay cold until most of the snow is gone, allowing the soils to warm and either absorb the snowmelt, or transfer the soil’s heat to the spring runoff. 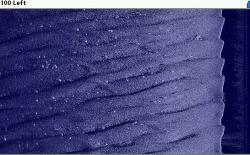 You can see an excellent example of walleyes relating to sand dunes in this Humminbird Side Imaging screen capture. Pre-spawn walleyes respond to this burst of icy cold water in predictable ways. First of all, recognize that the fish don’t move (or, don’t move very far). Biology and instinct has driven them to position on or very near spawning areas, and those biological urges have not disappeared. Unless the dip in water temperatures is also accompanied by an unusual, dramatic increase in water flow, the fish will typically not reposition within the river. That’s the good news: if you knew where the fish were in late winter, then you know where to focus your efforts when the water temperatures dip again. I use my Humminbird Side Imaging system to find large concentrations of pre-spawn fish, often associated with mid-depth sand dunes that provide feeding opportunities as well as areas protected from the increasing current. Another tool that we find very effective for finding fish at this time of the year is our Aqua-Vu underwater camera. In these cold, clear waters of very early spring, fish can be relatively easy to find with traditional sonar or high-frequency imaging techniques, so separating the undesirable fish (like shad, sheephead, suckers, etc.) from our target species is important for fishing with high efficiency. The Aqua-Vu Micro 5 camera system is incredibly lightweight and portable, has a long-life lithium ion batter, and features outstanding optics for excellent image quality in the relatively clear river water. Here is an example of how we use Aqua-Vu cameras to find early spring walleyes. Although the fish have not moved, their feeding habits are certainly impacted by the drop in water temperatures. Fish that may have been willing to crack a ringworm or run down a crankbait just a week or two earlier will now be significantly less active. Catching such fish with consistency can take one of two approaches. First, during the day, consider a very “old school” approach of a jig/minnow combo, or even a simply live bait rig with a 4″ leader and enough weight to maintain bottom contact in the current. When fishing jigs, we prefer H2O Precision Jigs from B-Fish-N Tackle. These jigs feature strong, long shank hooks, outstanding paint jobs that resist chipping on rocks or mussel beds, and weights that are molded right into the head to make jig selection easy. Under low light, we will switch back to light (1/16 and 3/32 oz) jigs and B-Fish-N Tackle ringworms, and fish these soft plastics very slowly, dragging them on long lines behind the boat. The flush of cold snowmelt marks the beginning of the true “pre-spawn” period for me. Fish will be gathering in large numbers in traditional spawning areas, and will gradually start feeding more aggressively as water temperatures rebound. As water clarity begins to decline, the bite will gradually shift to being stronger during the day. Charge up your batteries, dust off your jig box, and join us at the river for some improving, early spring walleye action. Dr. Jason Halfen owns and operates “The Technological Angler”, a media company dedicated to helping anglers learn to use their onboard technology to find and catch more fish. Their first full-length instructional video production, “The Technological Angler, Volume 1: Success with Side Imaging”, was the winner of the 2014 AGLOW awards-in-craft competition in the TV-fishing division. “The Technological Angler, Volume 2: Integrated Technology” teaches anglers to harness the power of 2D sonar, Side Imaging, Down Imaging, 360 Imaging and the i-Pilot Link system, to find and catch more fish. 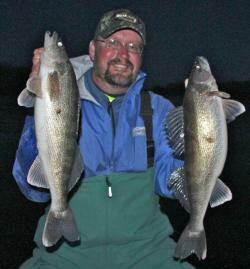 This entry was posted in Walleye and Sauger on March 22, 2015 by ronniegarrison.